Some urging questions about CCFLs, inverters and backlights will be answered in this FAQ. Our FAQ information is addressed to skilled and approved personnel, only. The exchange of CCFLs and inverters requires certain technical know-how. Without the required skills and approval the CCFLs, EFLs and inverters or even the whole application or device may get damaged! If you do not have either the skills or/and the approval we recommend to contact a service center. Q: The display of my notebook (laptop, flat screen, handheld, digital photograph, digital camcorder, LCD-TV) has rapidly decreased in brightness. What causes this loss, what can be done and what must be replaced? Q: My display is dark, but I can see the weak silhouette of my windows desktop on the screen. What is the cause? Q: How can I find out and check wether the CCFL tube or the inverter is defective? 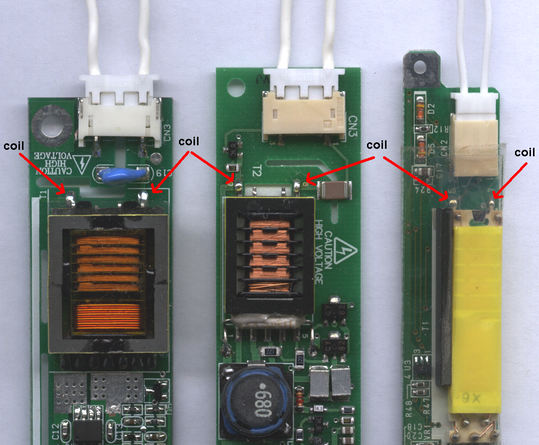 Which components on the inverter pcb are defective mostly? Q: Can I exchange this backlight CCFL myself? Q: I opened the display and I have build out the CCFL with the necessary caution. The original CCFL is 250mm long and 3mm in dia. You offer CCFLs of 245 mm and 2 mm or 4 mm dia, only. Can you offer CCFL with 250 mm and 3mm dia, too? Q: My TFT flat screen is defective. The repair center says that the inverter/driver circuit inside is responsible for the malfunction and has to be replaced, but they don‘t have or can‘t get a replacement circuit. What can be done? Q: In my old laptop I found right and left each side one tiny fluorescent tube. One recently burnt out and since the display is illuminated unproportionally. Would you suggest to replace both or only the burnt out CCFL? Q: The backlight of my notebook is nearly down and unfortunately it‘s out of warranty. The local dealer told me that the display has to be exchanged completely for about 600.- € or to buy a new notebook. What can I do? Q: After I‘ve received my notebook back from the repair service I noticed that the colours are slightly different than before. Is that possible? Q: Do your lamps conform to RoHS? Q: I would like to use CCFls to create my own, beautiful lamp. What do I have to consider for such a project? Q: I have a designer lamp which uses a CCFL as lamp. Can I make use of your CCFLs as an replacement? Q: What shall I do with the old built out lamp? A: The display of most flat screen displays, laptops, notebooks and many more is illuminated from behind by a special backlight. The light source itself is almost a very small and tiny CCFL shining from a side or top position into a layer of acrylic glass. Inside the acrylic glass, by specials techniques, the light is catched, reflected and at last diffused in such a way that most of the light proportionally passes through the display from behind. When brightness has noticeable decreased after a certain time of usage the CCFL inside is near its end of lifetime. In most cases this CCFL has to be replaced, only. We offer exactly those CCFLs and accessories like inverters, silicon-caps, cables and adapters to private and commercial customers. A: Either the backlight doesn`t work anymore or the the inverter is defective. If the display luminance was already weak or the light had a pink hue or the light was already flickering at start-up it will be the backlight which has to be replaced. If brightness was good and the malfuntion arose suddenly its with high probability the inverter, which has to be exchanged or fixed. A: If the backlight was already flickering or had a pinky hue in its corners or if the display is more than 3 years old and was constantly in use, this means that the CCFL is exhausted and at its end of life. The inverters are more difficult to check. If they are not loaded by a CCFL they usually don`t work. For a short time you can simulate a CCFL by using a resistor with values of the CCFLs working voltage over working current (e.g. 600 volts / 5 mA = 120 kohm at 5 watt) and check wether high voltage is generated. 1.Check the output coil at the contacts for the CCFL with an ohmmeter. If its below 500 ohm or on the other hand infite its defective. If this coil of your device is defective you will need a new inverter. There are no spare coils available as these are designed for their special application. If our listed inverters are of no help you may like to contact us for a supplier of your inverter. 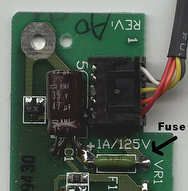 2.Most inverters in flatscreens and notebooks have a small fuse on its pcb. Can be a small white cuboid or white or green cylinder often with an imprint on the part, e.g. 1A or F1 or FU1 on the pcb. Check for pass of current. 3.The coil driving transistors are a source of defect sometimes, too. Check for function and replace with a similiar transistor. Easy to get from big sellers of electronic components, like Farnellinone or Conrad. A: In principle, yes, if you are technically skilled. But as a rule of thumb we recommend repair or service centers, which are specialized in that job. They have the necessary equipment to check and test the whole backlight circuit and are trained to deal with the necessary caution. A: Inbetween we offer 250mm x 3mm, too, but as an exception you can make use of another dia at the same length, too. In general we recommend to take almost the same dia. To take another dia depends on the available space. If there is room for a 4 mm dia CCFL you can take that type. If not, than the 2 mm dia will fit. The length of the replacement CCFL should come close to the original lamp. If we don`t offer this length take the next smaller one. (In case you need quantities, min. 30 pieces, of a certain type of CCFL that is not listed, we can offer to manufacture the exact type you need in about 4 weeks). A: As there is almost much space in TFT flat screens in case of emergency our standard inverters can help you to fix your display again to a sufficient degree. The inverter is supplied by the 12 Volt DC source of the original inverter circuit. Needless to say that this info is for professionals, only, as one has to add a fuse and to switch the regulating lines of the original inverter/driver circuit to ground or +potential. The brightness can`t be regulated directly, because of the missing dimming function of our standard inverter/driver. Indirectly you can adjust the TFT flat screen itself to a darker mode what gives in result less brightness. A: Yes, it‘s better to change both in that case and when your display is already opened so far. The other reason is that with a new CCFL and an old lamp you will have unproportional light emission again, although smaller in effect and the load of the CCFL inverter circuit is not symmetric anymore, means stress for the inverter. A: That’s a typical situation, „throw away your car when the lamps are down“. Look, here comes a better solution. If you are not technically skilled to replace the CCFL inside your notebook yourself, contact us for a local service address which can fix that for you incl. our CCFLs. A: Yes, that may occur. Imagine that each manufacturer of CCFLs has his own „white-light“ mixture for his CCFL. So, to confuse you: white is not white! And this means that the intensity of the basic colours differ to a small extend with the result in differences of hue. Mostly not really disturbing. One gets used to that very quickly. You can adjust this either with a gamma correction in the grafic options of your operating system (e.g. Windows XP). A: CCFLs and EFLS can`t work at all without a tiniest trace of mercury inside the tube.This is the reason why CCFLs and EFLs are exempted from the RoHS and are considered to conform RoHS. A: CCFLs with a dia of 2.6mm and bigger are most appropriate for that purpose. These are not too bright at too small diameter to hurt the eyes and they are not so extremly fragile like dia 2.3mm or smaller. For dia 4.1mm we even have clips to snap-in the tubes body. To prepare the lamps you will need silicon caps (2 for each CCFL), silicon cables with connector to plug into the inverter. Additionally you need an inverter. Our standard inverters usually work with 5, 12 or 24 volt DC supply. Means you need an AC power supply for your countries AC voltage, too. E.g. for an application of 2 CCFLs with 500mm x 3mm driven by 1 double-output inverter you need a power supply of 12 Volt DC at 1.2 A. We offer those jackets for a plug-in of the power supply, too, that you have all parts at hand. A: Yes, of course. We do not offer only the replacement lamps, but even different whit-colours(3200°K more red, 5200°K near daylight, 7800°K more blue) for common lamps. So, you may like to test another kind of white for your lamp?! A: Please don‘t throw it away like the usual rubbish. The lamp contains small quantities of mercury gas. You can send back this lamp to us or you can bring them to special storehouses which sell fluorescent lamps in general. Some countries like Germany, Switzerland and Austria have free poison collections once or several times a year. You can bring the old CCFL to them, too.